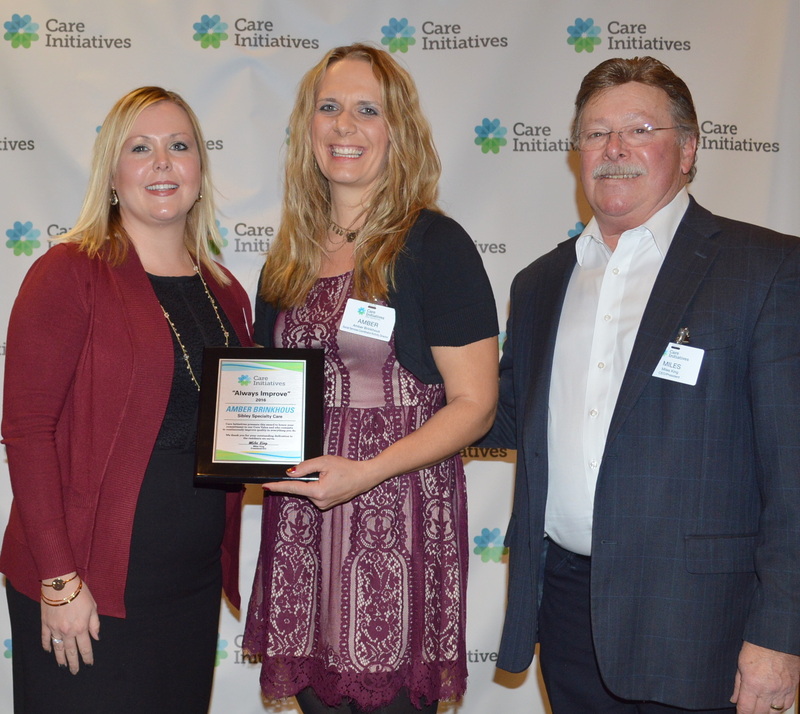 Amber Brinkhous, Activity Director at Sibley Specialty Care, received the Care Initiatives “Always Improve” award at Care Initiatives’ annual awards brunch Friday, Dec. 16 in West Des Moines. The award is given to a Care Initiatives employee who embodies the company’s core value to always seek out ways to improve quality in every way. “She is changing her activity program constantly to meet the needs of the residents,” said one nomination. Brinkhous has put her own twist on Goodcare’s program called “Heads, Hands and Hearts” which she received an award from the Iowa Health Care Association in 2015. She gave a presentation about this program to Care Initiatives leaders and she hopes to see the program develop in every one of the company’s location. “She has a teaching background and we are so happy she decided to leave the education world and come to the long term care world,” one nomination stated. “Her leadership is appreciated and valued.” The “Always Improve” award is one of six “Core Value” awards given to a nominated employee throughout our statewide organization of 3,000+ employees. Sibley Specialty Care is one of 50 locations owned and operated by West Des Moines-based Care Initiatives providing skilled nursing, rehabilitation, Alzheimer’s/dementia, assisted living and hospice care throughout Iowa. For more information about Care Initiatives or Sibley Specialty Care, visit careinitiatives.org or call 712.754.3629.